The United States recycles a lot of paper. In fact, paper makes up half of the overall recycled materials in the entire country. Though recycling paper is a fairly simple process, there are a few tips you should keep in mind. When recycling paper, try to keep it from getting wet as it may cause the paper to be unusable for recycling purposes. If you can, try to use a black marker to block out sensitive information on paper you intend to recycle as opposed to shredding it. During the recycling process ink can be easily removed. However, shredded paper reduces the fiber lengths, thus making it much more complicated to recycle and reuse as new paper. What You Didn’t Know About Paper Recycling – Recycling paper might not sound like the most interesting subject matter on the internet, but that’s where you’re wrong!. Paper Recycling 101 – This is a good thing as recycling paper saves energy, reduces greenhouse gas emissions, conserves natural resources and frees up landfill space for other trash that can’t be recycled. What is the Importance and Process of Paper Recycling? 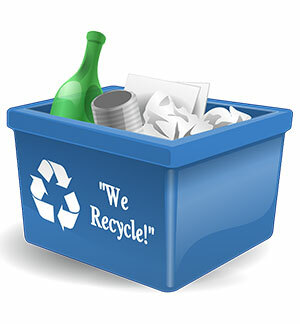 – Recycling paper helps preserve the environment and can be an excellent way to recover lost revenue for your business. 3 Important Truths About Recycling Paper – Most of us have a recycling bin nearby overflowing with paper products, so you probably won’t be surprised to learn that paper remains the most recycled of household waste materials. 5 Benefits of Recycling Paper – Responsible companies have a recycling policy because they recognise that recycling makes sense economically and environmentally. It also improves the image of an enterprise. Plastic has always been seen as a valuable resource, and should be recycled whenever possible. Most American communities have access to plastic recycling facilities, however the type of plastic that can be recycled varies from community to community. You can typically visit a community website to learn exactly what types of plastic you can recycle. Keep in mind recycling centers also want your caps and lids. It’s common practice to remove plastic caps and screw on lids before taking a trip down to the recycling center. However, plastic caps and lids are just as valuable as the container/bottle itself! 7 Things You Didn’t Know About Plastic (and Recycling) – Recycling is a lot more complicated, and the process of recycling plastics is significantly less transparent than the much-Googled recipe for baking cookie. 20 Ways to Reuse and Recycle Empty Plastic Bottles – The examples are plentiful, from water bottles to laundry detergent, to how we squeeze out our honey. You’ll likely spot one of the 50 million if you do a simple scan of the room that you’re in. The Process of Recycling Plastic Bottles – When you make the choice to recycle, what is the process of recycling plastic bottles?. How Plastic Recycling Works – The most recent human invention of plastic offers better containment for more items than just about anything we used before. Generally speaking, recycling metal will fetch you a much higher price than recycling cans and bottles. Many of our everyday consumer products are composed of metal thus making it one of the most highly valued resources to recycle. Products such as clothes hangers, batteries and appliances are just a few of the consumer goods we use every day that is composed of metal. Recycling metal has multiple benefits. The first is that recycling keeps metal out of landfills thus reducing the impact on the planet. The second is you can generally make more money recycling scrap metal than other recycles. Either way, recycling metal is a win-win for both you and the planet. Recycling Scrap Metal – Your scrap metal is worth money and can be melted down and remanufactured into new products, a process that considerably reduces greenhouse gas emissions and conserves energy and natural resources. How To Recycle Metal – Scrap metal is one of the most valuable products you can recycle, and it encompasses so many consumer products. Scrap Metal Recycling 101 – A Guide For Complete Beginners – You can help save the environment by turning junk into cash.. The Benefits of Metal Recycling – Recycling a ton of aluminum conserves up to 8 tons of bauxite ore and 14-megawatt hours of electricity. How to Recycle Metals – Recycling metal items from your household is an excellent way to save energy and help reduce overall waste. There are a number of reasons why you would recycle your electronics. For one, this allows you to protect your sensitive data from theft. It also allows you to prevent dangerous chemicals such as mercury from leaking from a cracked device and polluting the environment. Furthermore, clunky electronics can often take up valuable storage space. Recycling these items will allow you to free up more space in your garage. Recyclable electronic devices include computer monitors, TVs, cell phones, laptops and much more. How to Recycle Old Electronics – Many of the materials used in making these products can be recovered and reused, including plastics, glass, and metal. How To Recycle Electronics – Knowing how to recycle electronics is important in order to ensure that what we are tossing does not end up in a landfill, but rather is recycled back through the system. 11 Facts About E-Waste – When considering the importance of e-waste recycling, it’s worth remembering some of the more shocking electronic recycling facts from around the world, which illustrate the ongoing need for everyone to make an effort to conserve and properly recycle their electronic items. Recycling & Reusing Old Electronics – Tossing old electronics in the trash is terrible for the environment and completely unnecessary because there are much better alternatives for disposing of unwanted devices. Lawmakers have taken our dwindling supply of natural resources and negative impact upon the environment into account and have begun to take action. One of these actions is focusing on alternative sources of energy. Thanks to several enterprising businesses diapers have become a viable alternative energy source. Every year in the United States infants go through millions of diapers, clogging up landfills and negatively impacting the environment. Adult diapers take up even more space in our landfills, causing a major environmental problem due to landscape blight and water contamination. Thankfully, several companies have taken it upon themselves to begin recycling diapers to reduce this environmental impact. For example, diapers can be stripped of their plastic and fiber to be recycled and reused in newer products that include plastic components, roof tiles recycled paper and tubing. Though diapers may not be the first thing that comes to mind when one thinks of recycling and alternative energy they’ve certainly proven to be useful in both regards. Reduce, reuse, recycle. This is the way we will lessen our impact on the environment. Thankfully there are incentives to encourage many of us to recycle such as receiving money when we turn in cans, bottles, scrap metal and electronics. However, recycling does more than line our pockets with a bit of extra change. It also allows us to reduce our impact on the environment. With alternative energy sources such as adult diapers becoming more and more popular the future of recycling not only looks bright, but it has become more vital than ever.